Property 9: Traditional Brick & Flint Norfolk cottage, 2 mins from beach and local pub! 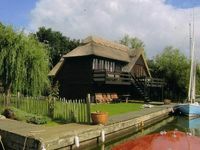 Property 21: Well-appointed, spacious 3 bedroom riverside cabin in tranquil Norfolk Broads. Property 24: Charming one bedroomed converted boathouse overlooking Broad, Ranworth.